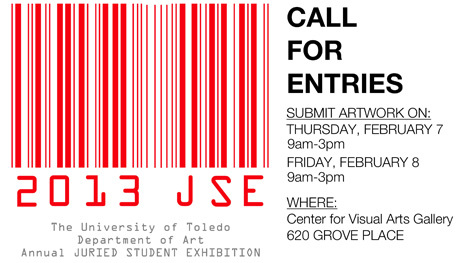 The University of Toledo Department of Art is calling for works from student artists for its annual Juried Student Exhibition. All currently enrolled students of the University — undergraduate, graduate and post-baccalaureate — are eligible to enter. The show is open to all media. The exhibition will be juried by Derek Coté, assistant professor of art at Wayne State University. The 2013 Juried Student Exhibition will open Friday, Feb. 15, at 5 p.m. Coté will give a lecture, and an awards ceremony and exhibition reception will follow. The free, public exhibition will remain on display in the UT Center for the Visual Arts Main Gallery through Friday, March 15. Artworks and entry forms should be submitted to the Center for the Visual Arts Gallery Thursday and Friday, Feb. 7 and 8, from 9 a.m. to 3 p.m. Each student may submit up to three works. Each piece submitted must have an identification tag affixed and must be accompanied by a corresponding completed entry form. Artwork shown in a previous UT Juried Student Exhibitions will not be accepted. Artwork must be installation-ready upon submission. For instance, two-dimensional work should be framed, display equipment must be provided for video work, etc. Artwork that does not comply with these guidelines will not be accepted. Entry forms and identification tags are available in the Department of Art’s office in the Center for the Visual Arts Room 1290 and online. To download a PDF of the entry form and identification tags, click here. Jury results will be posted on the Department of Art’s main office door Monday, Feb. 11. All work not accepted for the show must be picked up Monday or Tuesday, Feb. 11 and 12, from 10 a.m. to 2 p.m.
Work accepted for the exhibition will be on display for the duration of the show. These pieces can be picked up after the exhibition closes March 15. Some of the awards to be presented at the opening of the exhibition will be the Inga Reynolds Award for Work on Paper of $100, sponsored by Associate Professor Arturo Rodriguez; the Helen Fitzpatrick Fredricks Award of $250, sponsored by Associate Professor Barbara Miner; and the President’s Award of $250, sponsored by President Lloyd Jacobs. Also the Raphael Award for Excellence in Drawing of $100 is sponsored by Professor Emeritus Diana Attie, and the College of Visual and Performing Arts Installation Prize of $300 is sponsored by the Dean’s Office. The UT Department of Art sponsors a Best of Show Award of $350, a First Place Award of $275, a Second Place Award of $200, a Third Place Award of $100 and two Honorable Mention Awards of $50. 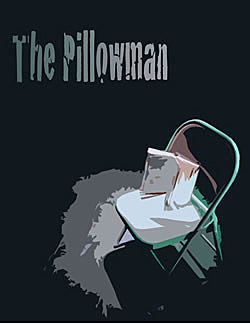 The Toledo Repertoire Theatre will perform Martin McDonagh’s “The Pillowman” Saturday, Feb. 2, at 8 p.m. in the Center for Performing Arts Studio Theatre. This extremely dark comedy is about a writer whose work mirrors a recent series of local child murders. Morbid and shockingly brutal at times, “The Pillowman” is a journey into the craft of writing, state politics, and the way the horrors of life are dealt with. Due to mature subject matter and strong language, this production is not suitable for young audiences or those easily offended. Stephen Harrick will direct the production. 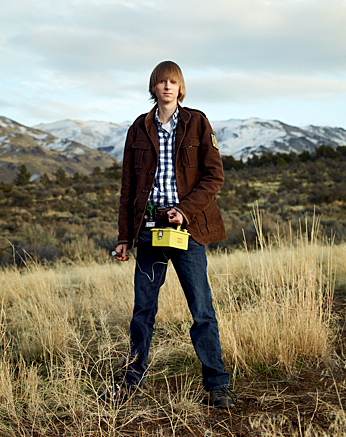 When Taylor Wilson was 13, he built his first nuclear fusion reactor. Wilson, a teenage nuclear scientist, will show off his innovations in the first Saturday Morning Science lecture Feb. 2 at 9:30 a.m. in Wolfe Hall Room 1205. Saturday Morning Science is presented by The University of Toledo College of Natural Science and Mathematics. The annual, free public lecture series is open to students, faculty, staff and curious science lovers of all ages. “This will provide an opportunity for the UT community and area residents to experience the excitement of scientific discoveries from the individuals who make them and write about them,” said Dr. John Bellizzi, UT assistant professor of chemistry. During the first lecture, Wilson will present “The Boy Who Played With Fusion.” He built his first nuclear fusion reactor in the garage of his parent’s Arkansas home. Currently 19, he lives in suburban Reno, Nev., with his parents and carries out research in applied nuclear physics at the University of Nevada-Reno. During his presentation at UT, Wilson will delve into the technical aspects of nuclear physics and specific applications in nuclear medicine and anti-terrorism. He is the youngest person to ever create nuclear fusion and the 31st person in the world to do it outside of government or industry. Since doing so, Wilson has been offered federal funding from the U.S. Department of Homeland Security and the Department of Energy to further his work regarding an inexpensive new way to build Cherenkov radiation detectors. Check out his website here. Saturday Morning Science lectures will continue Feb. 16, March 16, March 23, April 20 and April 27. Other topics the series will cover include genetics, the psychology of handedness and Antarctic meteorites. The series is directed by Bellizzi and Dr. Joe Schmidt, UT associate professor of chemistry. To learn more about Saturday Morning Science, contact Bellizzi at 419.530.5926 or john.bellizzi@utoledo.edu or contact Schmidt at joseph.schmidt@utoledo.edu. University of Toledo Medical Center is undergoing a re-engineering designed to better focus resources and maintain the quality of patient care. According to Norma Tomlinson, interim executive director of UTMC, the re-engineering changes are largely a mix of managerial and staff positions that will not impact the delivery of patient care. The responsibilities of nine positions have been combined with others, or have been redefined, as part of the process. In addition, there has been a strategic review of vacancies helping to minimize the impact, in consultation with the Department of Human Resources and Talent Development and UTMC leadership. All impacted employees have been notified. “We’ve been carefully reviewing vacancies to determine whether the position could be modified or absorbed,” Tomlinson said. “This gave us much greater flexibility in a way that will not impact patient care. Starting Tuesday, Feb. 12, UT employees and students will have the chance to attend seminars designed to add to the culture of diversity at the University. The free program is made up of six required and six optional seminars that discuss a topic on or related to diversity, some specifically dealing with UT. Those who wish to earn a diversity certificate must complete the six required seminars along with three of the optional seminars. Seminars will be held in Stranahan Hall and led by University employees who volunteer their time for the program. Seminars will include discussions on social psychology and diversity, compliance, supplier diversity and minority business, global citizenship and more. “The classes are taught by experts in specific dimensions of diversity, and the required courses speak directly to UT policies that are in place,” Gore said. While the program is aimed more toward employees, students are welcome to register and attend as well. To register, complete the form at utole.do/diversityclasses and fax it to the Office of Quality and Continuous Learning at 419.530.6177. For employees, registration forms must be signed by supervisors so they are aware that staff may require time off to take the classes. Though the program is free, departments will be charged $150 if an employee is a no-show. If there are any questions, contact Jeff Witt, program manager in the Office of Equity, Diversity and Community Engagement, at 419.530.8573. 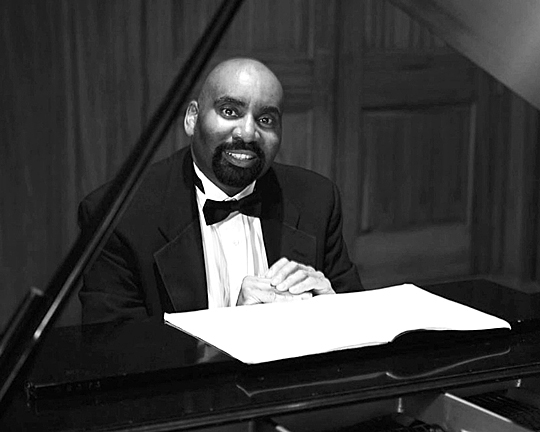 Dr. Anthony Pattin will return to his alma mater Saturday and Sunday, Feb. 2 and 3, and be the first artist to perform in the spring Dorothy MacKenzie Price Piano Series. He will present a master class at 10 a.m. Saturday and a recital at 3 p.m. Sunday. The free, public events will take place in the Center for Performing Arts Recital Hall. Pattin’s program will include works by Modeste Mussorgsky, George Gershwin, Franz Schubert and William Grant Still. A native of Toledo, Pattin is professor emeritus of music at the University of Montevallo in Alabama. He has performed as a soloist with many orchestras, and given recitals and presented master classes throughout the United States. He also has performed at Weill Recital Hall at Carnegie Hall and at Merkin Concert Hall in New York, and in Tokyo. A versatile musician, Pattin also is an accomplished organist, composer and arranger. He received a bachelor’s degree in music from UT and a master’s degree in music from the University of Michigan. The Toledo Piano Teachers Association assists with The University of Toledo Dorothy MacKenzie Price Piano Series. The association provides students for the master class, publicity for the class and concert, and refreshments for the reception in the lobby following the concert. For more information on the series, contact Dr. Michael Boyd, UT professor of music, at michael.boyd@utoledo.edu or 419.530.2183. Check out the 32-hour shoe sale! The Satellites Auxiliary’s sale will start at 7 a.m. Thursday, Jan. 31, and run continuously through Friday, Feb. 1, at 3 p.m. in the Four Seasons Bistro Atrium. Cash, check, credit cards and payroll deduction will be accepted. Profits will benefit the auxiliary’s nursing scholarship. The Satellites Auxiliary is a group designed to promote education, research and service programs; provide support of patient programs in accordance with the needs and approval of administration; conduct fundraising events; and provide volunteer services. For more information on the shoe sale, contact Lynn Brand, president of the Satellites, at lynn.brand@utoledo.edu. The University of Toledo football coaching staff will host a special presentation of its 2013 recruiting class in Savage Arena Wednesday, Feb. 6, at 4 p.m.
All Rocket fans are invited to attend free of charge. A concession stand will be open to purchase snacks and beverages. Head Coach Matt Campbell and his assistant coaching staff will announce their 2013 recruiting class and show video highlights of each signee at the event. Feb. 6 is the first day that high school seniors are allowed to sign national letters of intent. 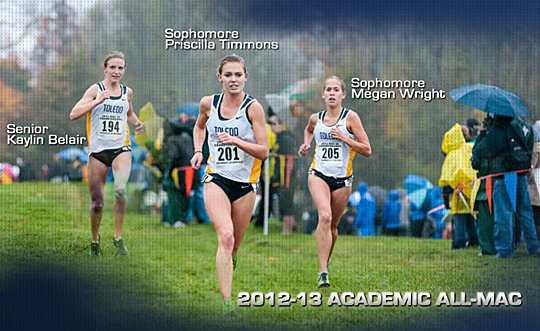 The event will be streamed live on UT’s official website, utrockets.com beginning at 4 p.m.
Three Toledo women’s cross country runners were selected to the 2012-13 Academic All-Mid-American Conference Team. Senior Kaylin Belair and sophomores Megan Wright and Priscilla Timmons each earned the recognition for the first time based on their efforts inside and outside of the classroom. The Rockets and Miami led the league with three runners appearing on the list. Belair was the top runner for the 2012 MAC Champions, leading the Rockets in nearly every race en route to the program’s highest national ranking in team and conference history (No. 15). An All-MAC first-team performer, Belair placed second overall at the MAC Championship and 11th in the NCAA Great Lakes Regional race. She was recognized as the MAC Runner of the Week following her performance at the Wisconsin Adidas Invitational when she set a personal-best time of 20:22.00. The senior also was the team’s top finisher at the NCAA Championship in 49th place. Belair has accumulated a 3.43 grade point average and competes on the UT indoor and outdoor track squad. Wright also was a first-team all-conference runner for the three-time defending MAC Champions. She finished third at the MAC meet, which ended up being her final race of the season after suffering an injury. Wright stepped up as a reliable runner when sophomore Mackenzie Chojnacky experienced an illness toward the end of the season. The pre-occupational therapy major posted a personal-best mark of 20:46.00 on the course and has a cumulative GPA of 3.35. Wright also runs on the indoor and outdoor track team. Timmons earned second-team all-league honors following her eighth-place finish at the conference championship meet. Most notably, Timmons raised her level of performance at the National Championship to finish second among UT runners. The sophomore also placed 29th at the NCAA Great Lakes Regional and recorded a personal-best time of 20:48.00 over the course of the season. A physical therapy major, Timmons carries the highest GPA of the three UT selections with a 3.71 mark. She runs on the indoor and outdoor track team as well. The Midnight Blue and Gold spent the entire fall ranked in the U.S. Track and Field and Cross Country Coaches Association’s National Top-30 Coaches’ Poll and captured its fifth MAC title in 2012. UT also made its third straight appearance at the National Championship meet, finishing in 28th place. A recent grant from the U.S. Department of Education will help ensure that local elementary school students who are deaf or hard-of-hearing soon will have new opportunities to learn. The University of Toledo and the University of Akron will use a joint grant to develop course work and practicum experiences for speech-language pathology graduate students. 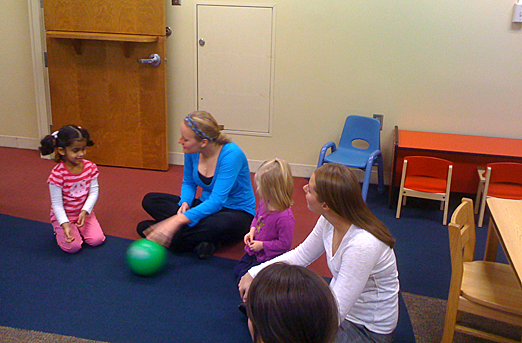 Lauren Notario, left, and Emily Everly, students in the Speech-Language Pathology Program, worked with children in the Auditory and Language Enriched Program. UT’s Rehabilitation Sciences received the grant last fall for maximizing listening and spoken language of children who are deaf and hard-of-hearing through advanced technologies, according to Dr. Lori Pakulski, professor of speech-language pathology. She said there is a great need for the program because there are very few people trained in this field in northwest Ohio. Pakulski said there have traditionally been two schools of thought in the audiology field. There are those who believe one should never force a deaf or hard-of-hearing person to use technology such as cochlear implants or hearing aids, and he or she should embrace deaf culture and learn sign language. But the opposing viewpoint believes in those devices and supporting a family’s desire to help children learn to listen and talk. Pakulski said she is working on the grant in conjunction with Dr. Todd Houston, associate professor at the School of Speech-Language Pathology and Audiology at the University of Akron. Pakulski said the grant and new program also play into the Auditory and Language Enriched Program, a play group for young deaf and hard-of-hearing children that is run by speech-language pathology graduate students as a community service. The program helps young children in similar circumstances bond, while targeting listening and spoken language skills and educating parents. Both UT and UA will choose five students for four of the five years the grant is in place. The first group of first-year graduate students accepted into the UT program are Adam Barnes, Mary Dunn, Ryan Rummel, Emily Russell and Leslie Starr.